Crowd packs Line 3 public hearing. If the public hearing on the Line 3 tar sands in St. Paul Tuesday is any bellwether, the project should be stopped – just like Sandpiper. The overwhelming majority of attendees spoke against the Line 3 plan, which threatens the Mississippi headwaters region and many clean lakes and rivers in northern Minnesota. 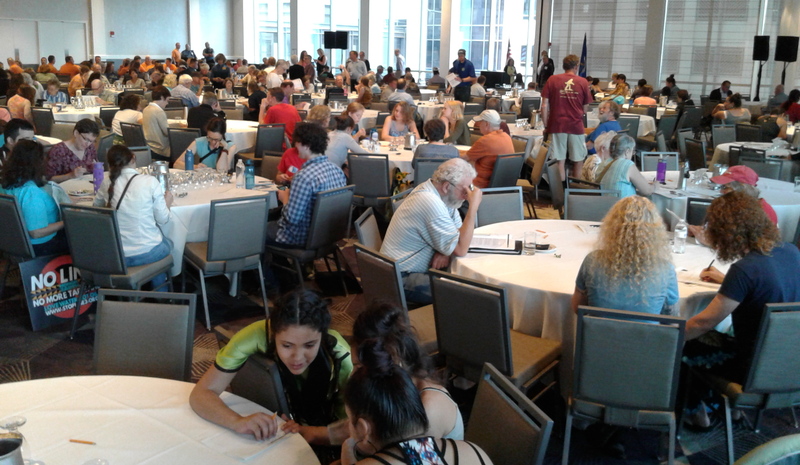 More than 350 people packed a large hall at St. Paul’s Intercontinental Hotel. More than 80 percent of speaker s opposed the project and criticized the draft Environmental Impact Statement (DEIS) under discussion. The Minnesota Department of Commerce, the lead agency on the DEIS, had allotted two hours for comment. So many people wanted to speak they added an extra half hour to the event and still didn’t get through the list of people who wanted to speak. Sierra Club volunteer Jean Ross was one of nearly 50 people who did get the microphone. She asked the Department of Commerce tough questions about why the Minnesota Department of Natural Resources (DNR) and the Minnesota Pollution Control Agency (MPCA) didn’t have a stronger voice in decisions about Enbridge’s proposed Line 3 pipeline expansion. Ross said the DEIS fell short because it did not include a “no-build” option. “Be part of the future, not part of the past,” she said. For the full post, click here.